I recently had the pleasure of capturing Sandra and Ruben’s maternity photos on an afternoon in December. We captured this amazing couple at the brand new Boston Studio Rental in Braintree, MA. As you can see from the pictures Sandra is absolutely glowing, pregnancy seems to agree with her. This baby will be here any day now. Sandra and Ruben have been together for a little over four years. They were married a little over a year and a half ago and I was also blessed to be part of their big day; that was when I first met this incredible couple. They hired me to provide my photo booth services during their wedding. I love when I am blessed with the opportunity to capture a couple’s journey over and over. I had an incredible time at their wedding. As you can see by these adoring maternity photographs we had a blast at Boston Studio Rentals. Obviously I’m already looking forward to photographing the infant’s newborn photographs. This is Sandra and Ruben’s first child together but they also have a boy and girl. Their adorable older children are 7 and 11 years old. I created this studio to offer a down-to-earth space where I could bring creative concepts to life. No matter what your specialty whether it’s boudoir, newborn, portraits, headshots, film or video, Boston Studio Rental will feel relaxing and comfortable. Boston Studio Rental has what you need to blow your clients away! I recently had the pleasure of capturing Jude and Yoon’s maternity photos on an absolutely gorgeous afternoon in September. 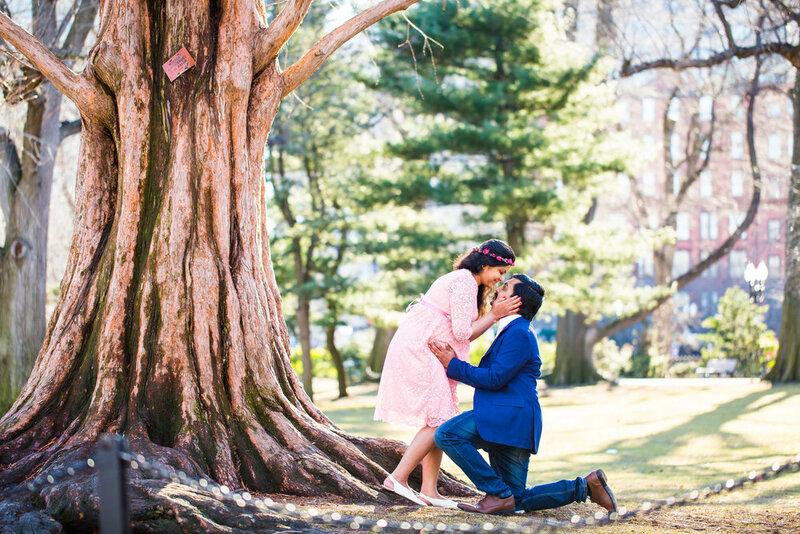 We captured this amazing couple at the Boston Public Garden in Boston, MA. Jude is absolutely glowing, pregnancy seems to agree with her. As you can see this baby will be here any day now. Luckily we were able to capture these photographs before we were blessed with this little bundle of joy as their baby boy is due to arrive in October. Jude and Yoon have been married for five years, this is their first child. Jude works in Boston and Yoon is finishing up grad school. This loving couple got married in Korea where they are from. This happily married couple has been doing a lot of traveling recently but are looking forward to settling down once the baby arrives. I recently had the pleasure of capturing Diana & Gee's maternity photographs on a beautiful morning in May at Webb Memorial State Park in Weymouth, Ma. Located just minutes south of Boston, Ma Webb Memorial State Park provided an amazing back drop for this loving couples photo's. Webb Memorial State Park is a local recreation area on a peninsula that extends close to half a mile into the Hingham Bay area of Boston Harbor. It is made up of three connected drumlins and a low marsh area. Congratulations Diana and Gee on the new baby! 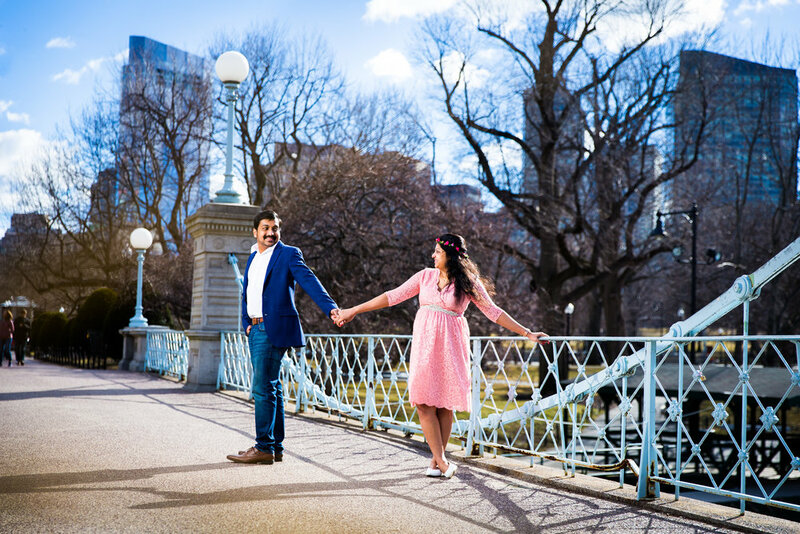 I recently had the pleasure of capturing Vik and Ritu’s Maternity photographs on an incredible afternoon in May. 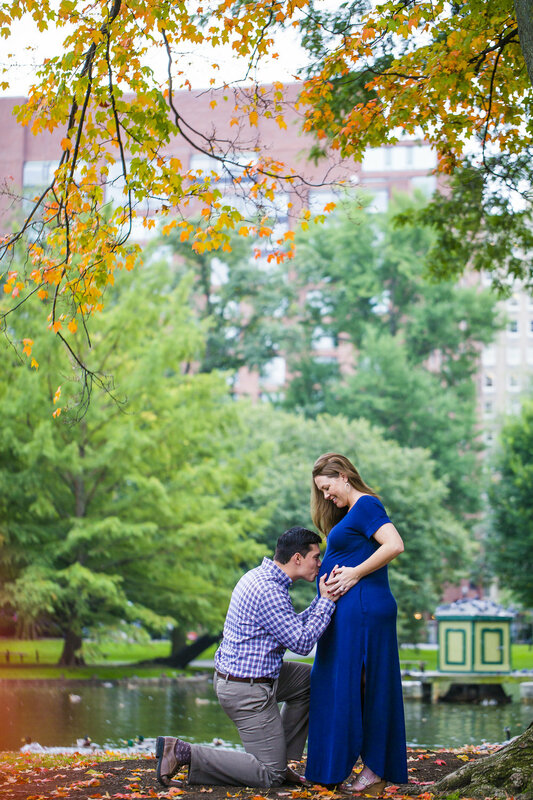 We went to the Boston Public Gardens first; soon after a few more maternity shots on Acorn Street. Boston Public Garden is a large park in the soul of Boston, Ma, neighboring Boston Common. Its 24 acres in all and was actually the first public botanical garden in America. 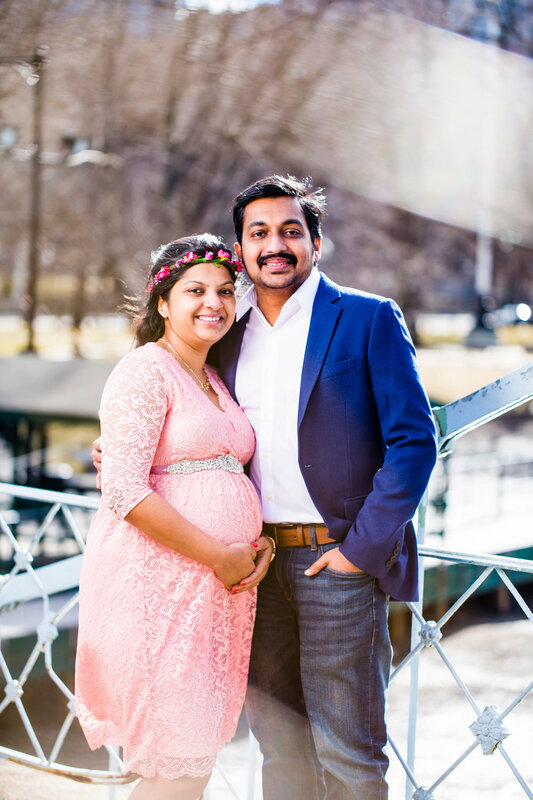 These are actual pages out of Vic & Ritu's adorable maternity album! After walking around the Boston Public Garden we decided to move to Acorn Street, located in the Beacon Hill area of Boston Ma. Beacon Hill is a historic neighborhood in Boston, Ma. It is a community of Federal-style row houses and is known for its narrow; gas lit streets and brick sidewalks. Acorn Street is one of the most photographed streets in the US. Congratulations Vic and Ritu on your new bundle of Joy! 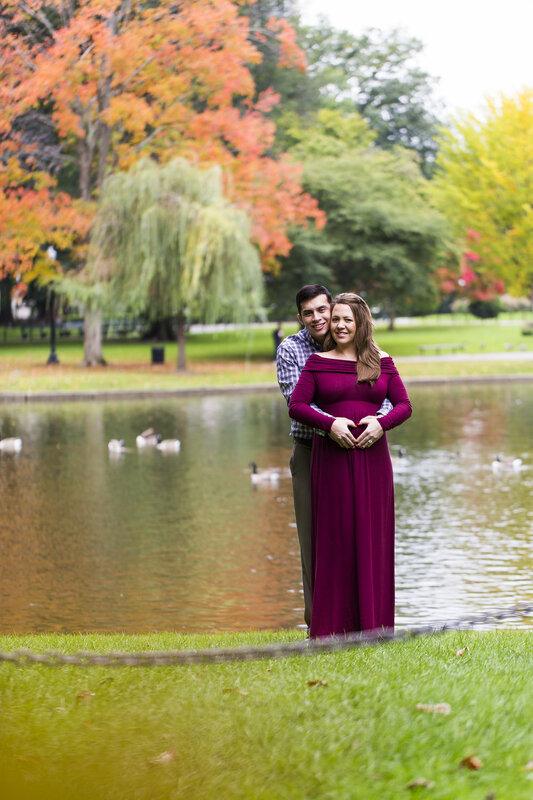 I recently had the pleasure of capturing Maryann and Steven’s maternity photos on an afternoon in March. 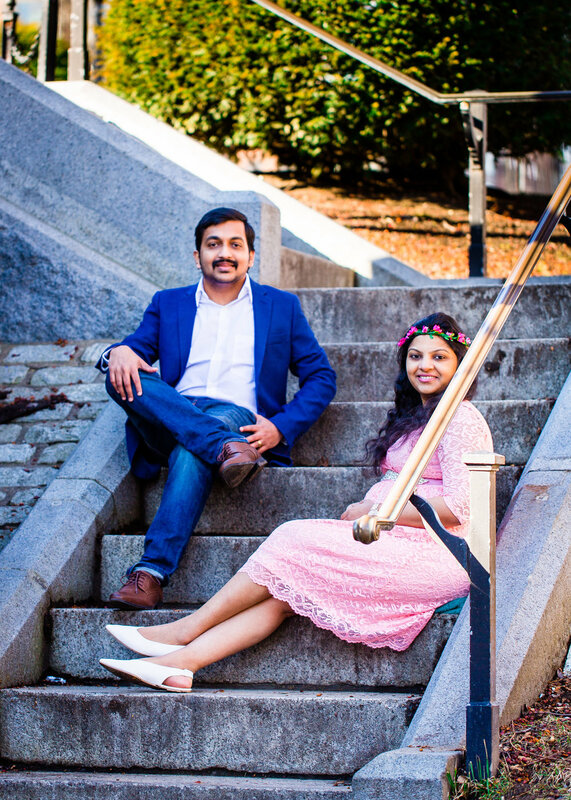 We captured this amazing couple on Acorn Street in the Beacon Hill area of Boston, MA. Maryann was absolutely glowing; pregnancy seems to agree with her. This baby will be here any day now. Luckily we were able to seize these photographs before we were blessed with this little bundle of joy. This little angel will be here any day now; they are expecting a baby girl. Maryann and Steven have been married for a few years now. I was also blessed to be part of their big day as I was also their wedding photographer. Being a photographer affords me the opportunity to capture a couple’s journey one precious moment at a time. 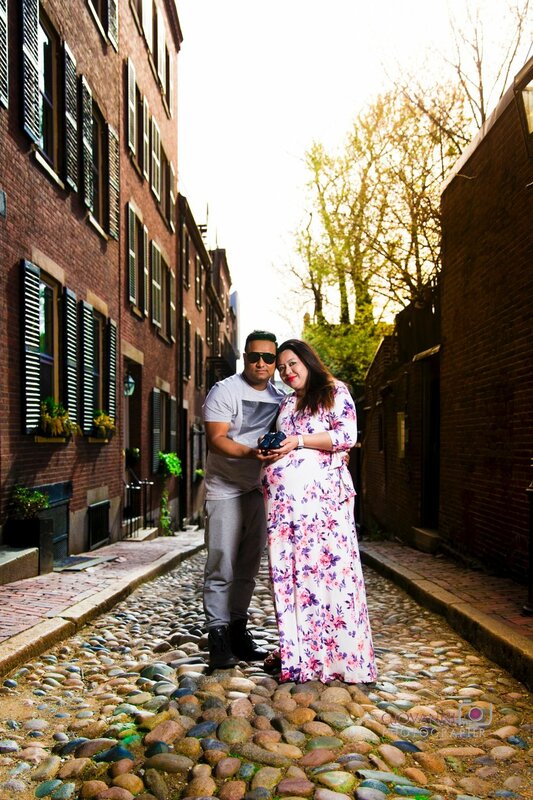 As you can see by these adoring maternity photographs we had a blast on Acorn Street. Obviously I’m already looking forward to photographing their infant’s newborn photographs. This is Maryann and Steven’s first child together but they are planning on having more. Acorn Street is location in the Beacon Hill area of Boston, MA. Beacon Hill is a historic neighborhood. It is a community of Federal-style row houses and is known for its narrow streets and brick sidewalks. The breath taking architecture and historical feel make for amazing backdrop!